He’s made Kirtan (devotional music) a best seller. He’s moved millions with his heart-felt vocals and harmonium playing. He’s performed on the Grammys. He’s the subject of a documentary that was released in 2013. He’s the Kirtan Wallah (maker), aka Krishna Das, and we were so blessed to bring him to Miami in conjunction with the release of his 14th CD. The Kirtan rock star, Krishna Das, conducted a workshop at Miami’s Unity on the Bay, Friday, April 11 from 2 to 5 p.m and the next day, he was on stage from 8 to 10:30 p.m., at the Julius Littman Performing Arts Theater in North Miami Beach. Great concert and Workshop! Thank you KD, Mark Gorman and Arjun. We are grateful! The 2013 tour continued Snatam’s inheritance as one of the most celebrated touring sacred singers performing in the world today. This is a woman who walks it like she talks it . . . or sings it. 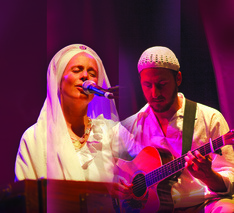 Snatam Kaur brings out a bit of the divine peacemaker in all of us. Vibration of Life - Showcasing South Florida's Holistic Community was an event to share local holistic options available in South Florida. Whether coming to MantraFest or not, participants had the opportunity to experience some of South Florida’s best in meditation, drumming, healing arts, ayurveda, organic vegetarian meals, etc. It was held in the beautiful new South Miami-Dade Cultural Arts Center (same place as MantraFest, so no extra driving required). MantraFest 2013 performed in Miami at the South Miami-Dade Cultural Arts Center on September 28th & 29th as part of the 25 city tour. 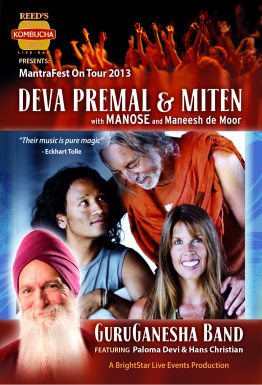 Miten comments: "For Deva and me, this tour is about coming together in celebration of a New Beginning—an invitation to celebrate the momentous shift in humanity's planetary attitudes that is currently underway—a positive change in the way we view the resources we consume, a change in how we view ourselves as messengers of this transformation that is now upon us all. The direct, daily experience that Deva and I have is that mantras support us through every challenge. Our mission is to share this powerful healing tool with the world. And we know that this is a mission we share with GuruGanesha. His music has always been remarkable for a depth of spiritual connection that has a real sparkle and twinkle." All Stars of Mantra Music Came to Town!!! The GuruGanesha Band is the latest project from the mind, heart and guitar of world devotional music pioneer GuruGanesha Singh. Renowned for his work with sublime vocalists like Snatam Kaur, Nirinjan Kaur and Tina Malia, GuruGanesha steps into the limelight with his latest musical venture, a multi-talented ensemble culled from the A-list of players and singers on today's rapidly-expanding kirtan/chant/yoga music scene. "This is a project that I've had in my heart for many years," says GuruGanesha. "The idea behind The GuruGanesha Band is to bring to the world music scene a group that can musically hold its own with the great guitar bands of all time, but instead of conventional lyrics, singing mantras and divine poetry to transport audiences to a profoundly beautiful and transcendent place. All of the spiritual and musical work I've done for the past 39 years has been preparing me for this." 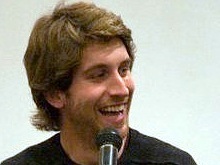 GuruGanesha describes the GGB sound as "a unique blend of kirtan, raga, rock, and deeply meditative folk music. I will primarily be playing electric guitar and I've hand-picked the musicians not only for their musical virtuosity but also for their ability to channel the spiritual energy that the band will be serving. The vocals will be a group effort with plenty of rich two and three part harmonies though Michelle will regularly step out and blow people away with her amazing vocal improvisations. The audience will be encouraged to fully participate, whether it be singing along, dancing or just meditating deeply on the music." What a magical evening of music, stories, joy and inspiration GuruGanesha and his incomparable band shared! Thank you South Florida for showing up and making it such a beautiful event. All profits from the concerts were donated to some of GuruGanesha's favorite charities. For more info on the GuruGanesha Band, please visit their website by clicking HERE. We started off this movie series by bringing I AM back for a return engagement. After having an overflow crowd show up at the Gusman theater last year, we have had many requests to show this deeply inspiring movie again. Well we did it again! It was shown on Thursday, June 28th @ 7PM to over 175 people. What an amazing evening. We had a short discussion session after the film which was a moving experience for many who shared their thoughts about the film. We are thankful for the turnout. Click here for more info on I AM. Next we hosted a premier engagement of the new movie Awaken, Soul to Soul. It is an unprecedented, transformational film that offers a one on one, direct experience in real time with some of today's leading sages, luminaries and healers. And we finished off this summer's series with Living in Light, which was a first time showing of the movie in South Florida. Guided by Neale Donald Walsch, the acclaimed author of “Conversations with God”, Living in Light is a powerful documentary that explores new spiritual insights into the true nature of our existence. Set in the idyllic islands of Hawaii, Living in Light addresses pressing issues of modern life: dealing with fear; understanding traditional belief systems and how they may help or hinder us; pursuing happiness; interpreting the true nature of consciousness and divinity; and ultimately, discovering what needs to be done to experience enlightenment. This was shown on Thursday, August 16th @ 7PM. Each movie was followed by a discussion session as we brought our community together and expressed quite beautifully who we are. Thanks for helping us make these summer movie nights such a success!!! With Writer/Director Tom Shadyac appearing LIVE! What a beautiful evening! Thanks to all who came and enjoyed the movie. We apologize to all that were not able to get in. We are in the process of setting up additional showtimes here in Miami in the near future. Please signup for our newsletter to keep up to date on our progress. And thanks to writer/director Tom Shadyac, Producer Dagan Handy and associate producer, home town favorite, Nicole Pritchett for their assistance in putting this amazing evening together. This was a wonderful evening of a stunning collaboration of artists: poet and translator of Rumi, Coleman Barks, iconic world percussionist Glen Velez, Grammy award winning cellist David Darling and internationally acclaimed Storydancer, Zuleikha, as they brought to life the rapture and longing of 13th century mystic Rumi’s ecstatic poetry. It was filled with Rumi's timeless message of love and hope in this extraordinary world-class performance of poetry, music, dance, story and humor. "Food for the soul!" Thank you for helping us create such a beautiful experience for each of these events. We had over 1300 at the Gusman in 2011 chanting, lauging and loving. It was a true blessing having you there with us. Such a blessing to offer these beautiful souls to our South Florida commUnity! Thanks for showing up and making these events so special with your presence.